Shanghai, China, once known as the Paris of the East is still a stunning sight as a cosmopolitan metropolis. With many futuristic skyscrapers dominating the cityscape, the old alluring Shanghai with its romantic past is still present in its 1930s Art Deco architecture structures and tree lined alleys. Ever since the 2008 World Expo, the authorities cleaned up the streets for congress. 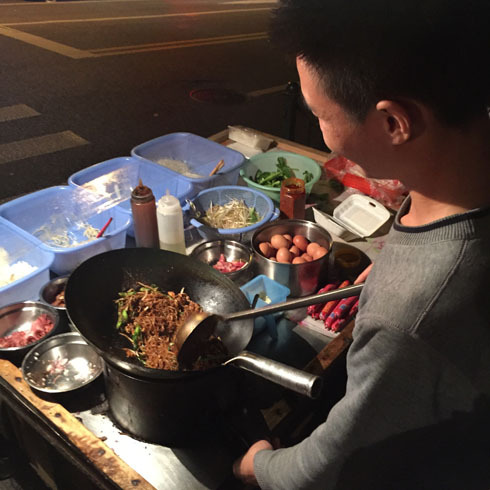 Although many of the street food have been relocated into shopping malls, nothing beats tracking down a street hawker by the road to get a taste of the old Shanghai. Despite the occasional crackdowns, we are able to locate some of them along the back alleys at night. Many of the nameless stalls featured below shift around regularly, and its somtimes a matter of luck whether you can find them. The street they are usually on on won’t be too far away though. 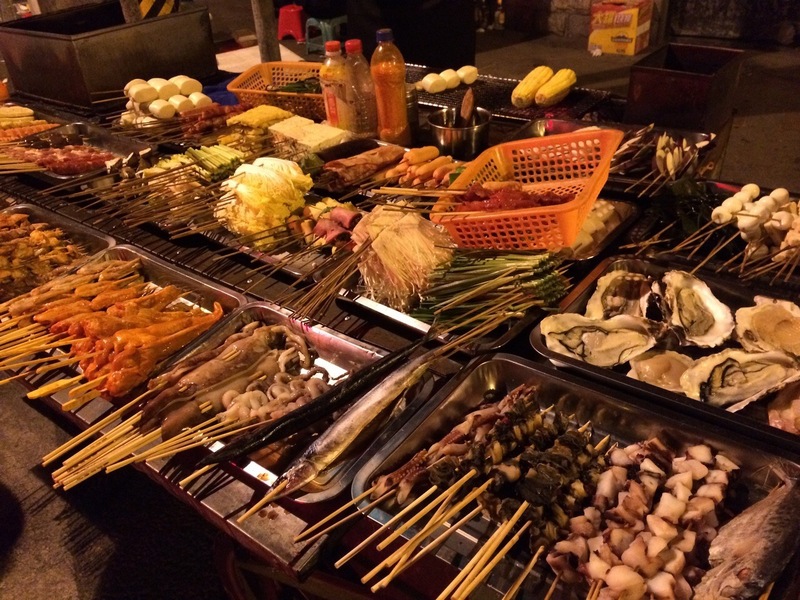 While Shanghai is famed for its high life and fine dining, don’t ever leave the city without trying its local delights. Usually carbo laden, it can be too salty, too oily and too much msg. So sinfully tasty, its definitely worth trying at least once. Literally translated as “cool skin” this dish is great for the hot summery weather although it is available whole year round. Made with bean starch jelly noodles and toss with coriander, peanuts, garlic and doused in a generous serving of vinegar and chilli oil. This dish is a great appetizer and goes well with the other small bites. Usually a breakfast item, their you tiao (dough fritters) is similar to what we have in Singapore. 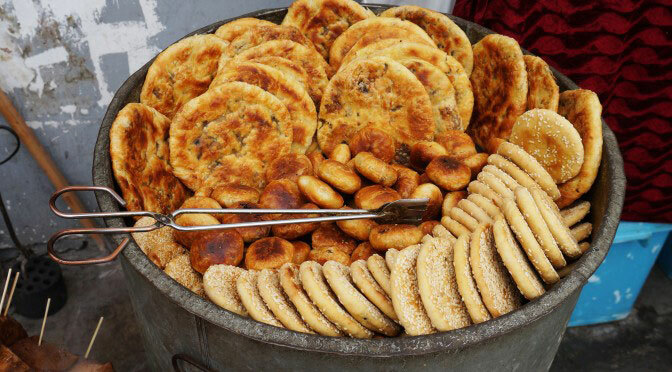 Da Bing is a starchy dry sesame pastry that are baked in a barrel similar to what the Indians do with the Naan. 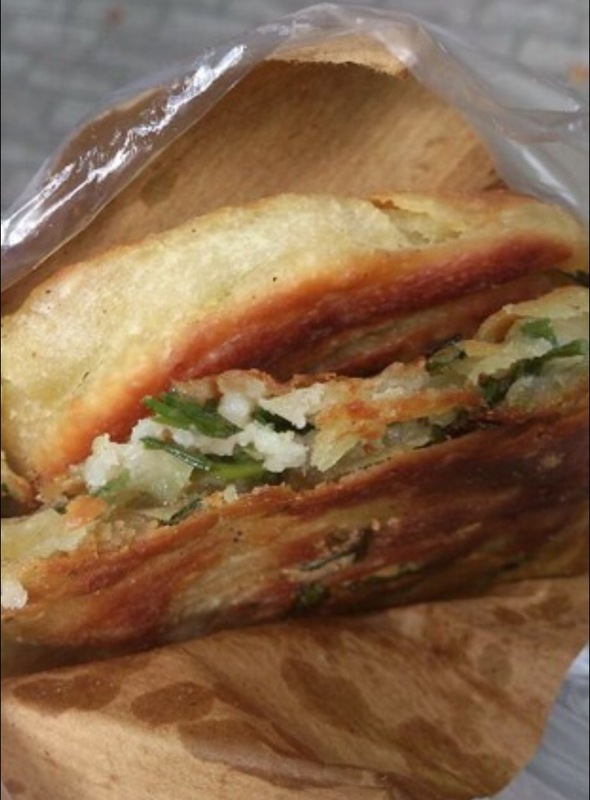 Its dry and flaky pastry actually goes well with the savory Tou Jiang. 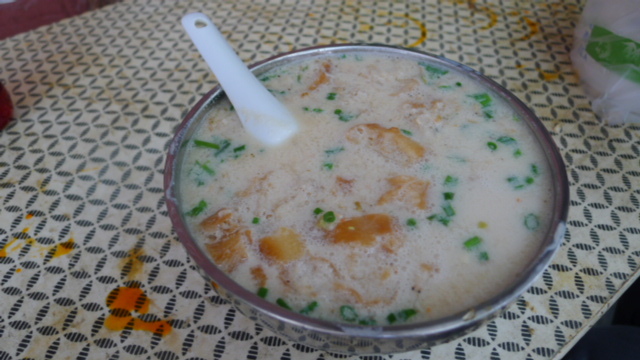 While most Singaporeans are familiar with the sweet beancurd dish, the Shanghainese eat it very differently from us. Savoury Tao Jiang is curdled upon adding vinegar and then sprinkled with a generous serving of coriander and peanuts. Somewhat like a salty sourish soup. 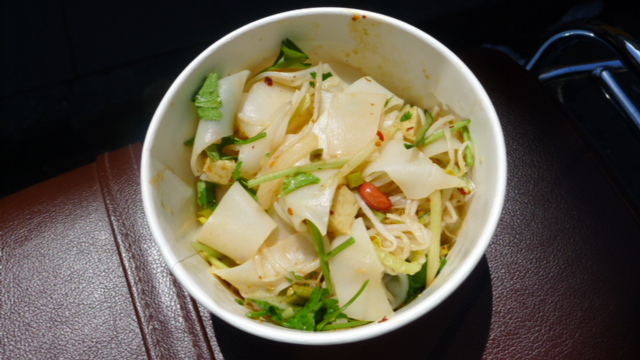 Savoury Tou Hua is eaten with bits of pickled mustard and radish, minced dried shrimps, coriander and added with chilli oil and vinegar for the extra punch. 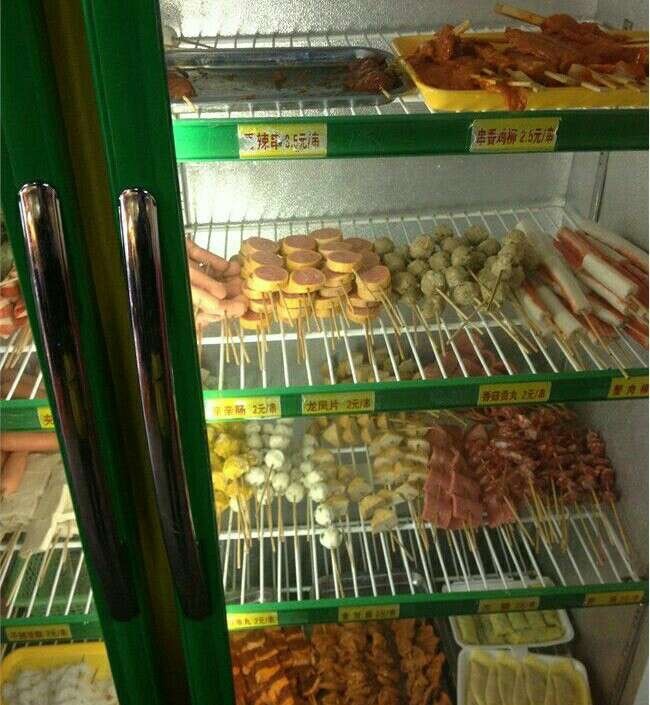 The same little small shop that sells the You Tiao / Da Bing, it is patronize by many local shanghainese in the morning on their way to work. 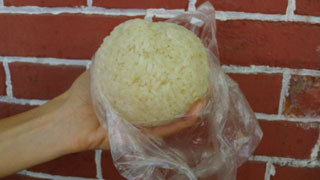 Another breakfast / brunch item, this huge glutinous rice ball is very filling. 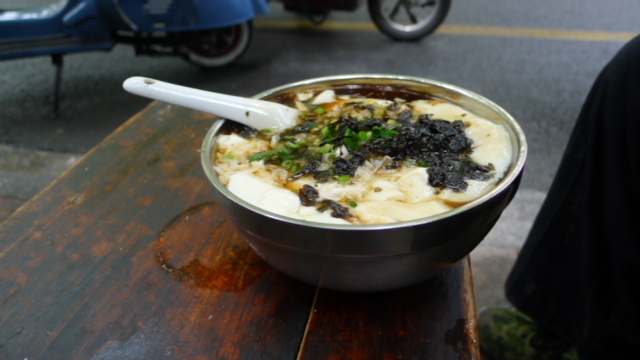 The hawker usually have a huge wooden barrel keeping its glutinous rice soft, warm and ready for an order. Some places have a mix of brown & white glutinous rice. You can have it “sweet” with sugar or savoury with chopped salted mustard veg and a you-tiao wrapped inside the rice ball. Each rich ball is prepared fresh, nicely compressed after adding your preferred ingredients. Additional pork floss/egg/ salted egg can be added for a small fee. Usually available as a breakfast takeaway, this savoury crepe is pan-fried fresh upon every order on a flat griddle. A millet flour mixture spread thin with an egg cracked on top. As the flour turns a light golden brown, it is spread with a sweet hoisin-like bean paste and sprinkled with coriander, spring onions, chilli flakes and pickled mustard pieces more commonly known to us as salted vegetables. 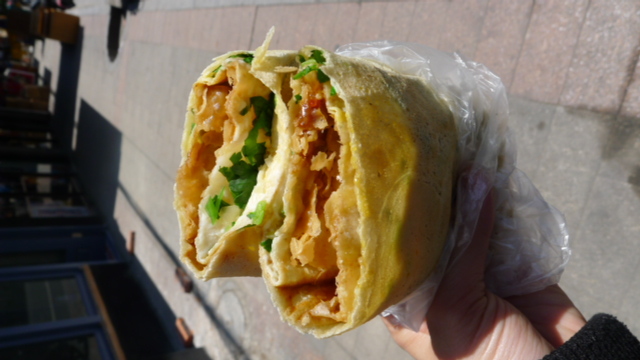 You can then choose to add a “you tiao” or a deep fried beancurd skin” that is rolled into the thin popiah-like skin as the egg sets. It is then wrapped and folded into half. Easy to hold and eat as you go. 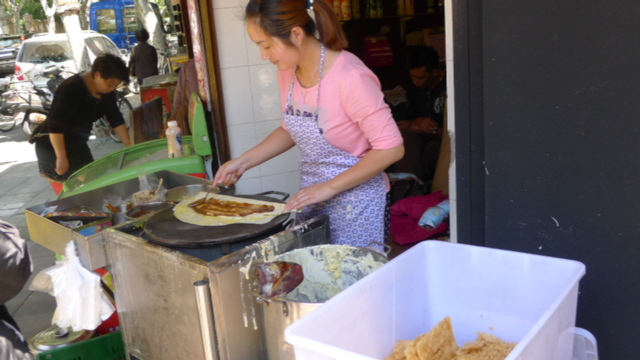 *This bicycle cart stall disappear once the crepe batter is sold out and sometimes as early as 9am in the morning. 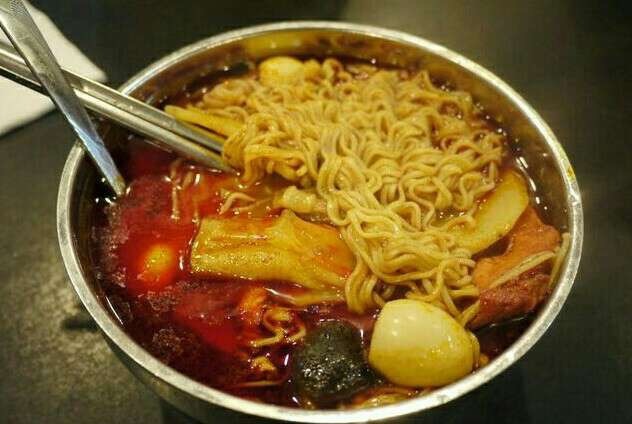 Classic shanghai comfort food, most places takes pride in their la-mian (Chinese noodles) and it is usually hand-pulled. 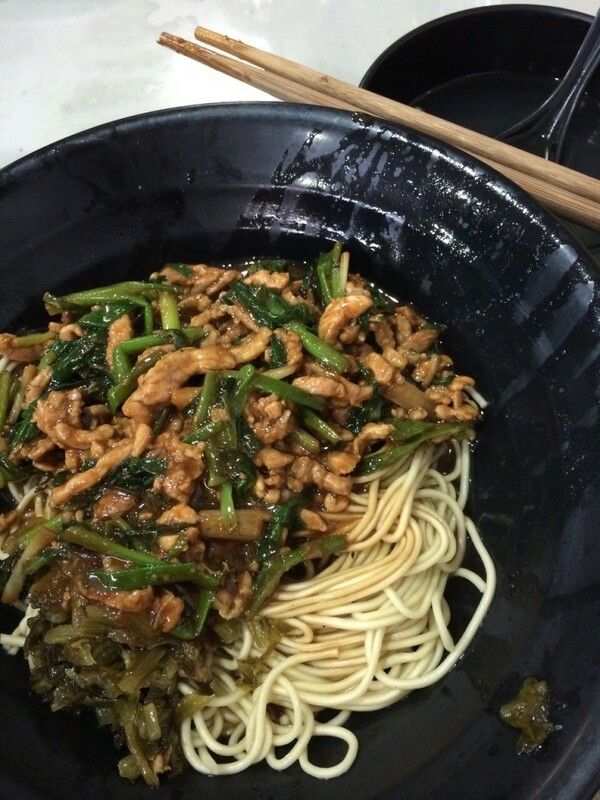 A simple dish that is sold even in high end restaurants, this is a must try noodle dish. Simply stirred in scallion fried to golden brown in oil or (pork fat), soya sauce and some dried shrimps. The scallion oil is coated on every strand of the noodles, ensuring every mouth is flavourful with a crunchy bite of the dried shrimps. 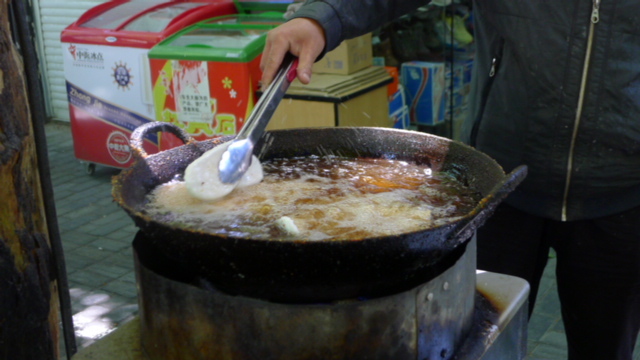 Adding black vinegar is a popular option as it provides a sweet sourish contrast. Somewhat reminds me of our Yong To Fu, except there are too many different ingredients to choose from. This hot and spicy soup base is as what the name suggest. Mala spices (consisting of a variety of fennel, cumin and the Sichuan pepper corn) are used to cook the broth but if you can choose the non spicy version which is clear meat broth with a burst of spices without too much the burning numbing sensation. Usually eaten as a soup with a noodle of your choice plus adding lots of peanut sauce, vinegar and chilli. 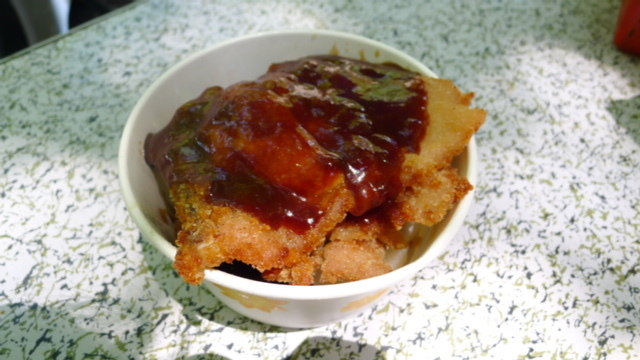 Pieces of Nian Gao (rice cakes) and breaded pork cutlets are deep fried separately upon your order. The Nian Gao and port cutlet are then neatly cut into small rectangular slices and drizzled with a thick brown sauce. I expected a sickly sweet salty and oily combination. Much to my surprise, the lightly salted and fragrant sauce (tasted somewhat like Worcestershire and soya sauce combined) goes very well with the rice cake and slices of piping hot pork cutlet. Add vinegar for the extra punch that balances off the oily after-taste. *This hawker stall is parked on the pavement with 2 small make-shift tables and foldable chairs. Never leave Shanghai without trying this all time favourite. 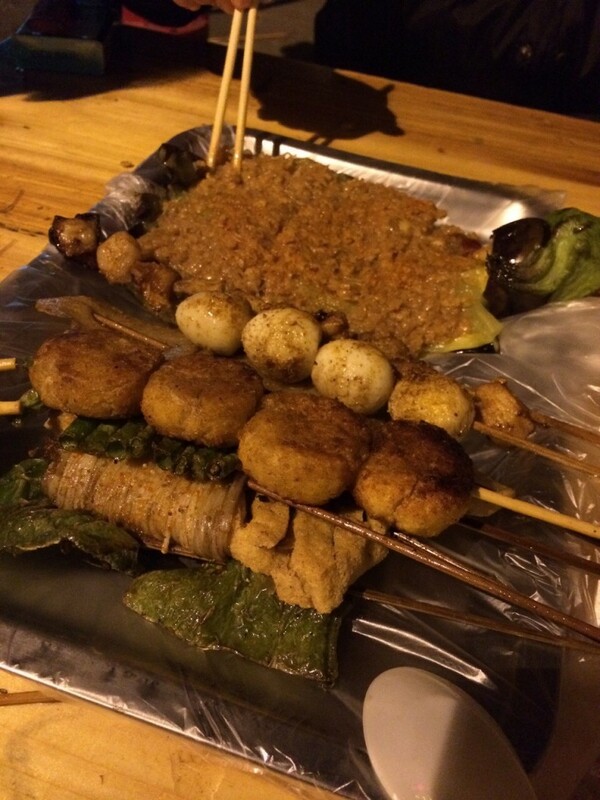 You get skewers of variety from vegetables to pork liver, chicken wings and seafood to choose from. Nicely Chargrilled to a lovely brown from charcoal as the vendor fans to give it a smokey finish. The amount of chilli powder is added as per your request and brushed with their special BBQ mixture. Every vendor has a different special BBQ powder of their own concoction but it is usually a mix of paprika, cumin, salt, sesame oil and Sichuan peppercorn. Served hot, and accompanied with beer. One particular skewer dish to try – BBQ eggplant with garlic and spices. It is served warm, soft and melts into your mouth. Another local favourite noodle dish which one can found along the back alleys as dusk approaches. 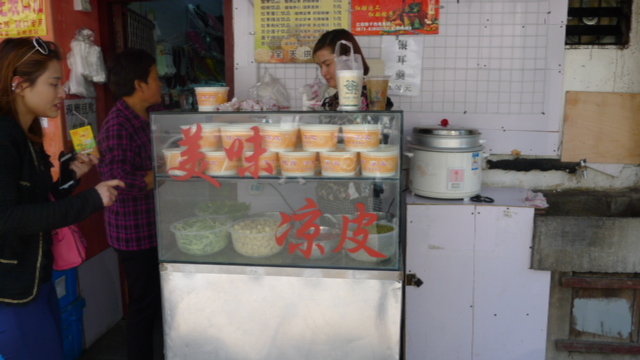 A small stall that sells fried rice, noodles, kway teow, rice cake pieces with options to top it with an egg. 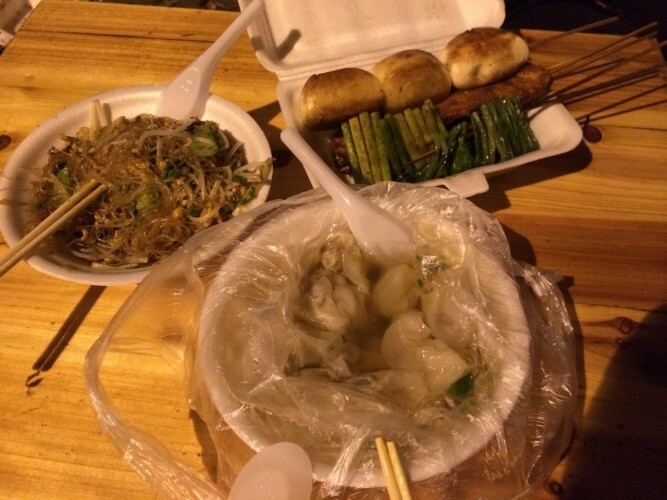 You”ll be surprised that they also serve up wanton soup which is great to go with the fried dishes. You can request to have your stir-fry done in any way you like it. The wanton soup is similar to what we have in Singapore. With many tiny wantons suspended in a clear scallion oil soup, it goes well with the dishes after a late night of drinking. *Lovely middle aged couple who runs the stall. Wife is the very patient cook who accommodates to my many request of a more spicy, less oil, less salt, no msg, no meat, and no chicken powder (very popular artificial flavouring commonly used). Grounded peanuts (some hawker uses red bean paste) and black sesame combination spread like a sandwich in between two layers of coarsely grated rice flour before dried osmanthus flowers are scattered generous on the top. Cut into small 2 inch bite size squares, it is placed inside a steaming hot wooden barrel. The little squares of rice flour is firm and holds the sweet thick paste together. While the smell and the texture reminds me of our local putu piring, the osmanthus flowers has a much milder fragrant. Each round ball of dough is kneaded by hand and mixed with a pinch of minced pork and chopped spring onions. 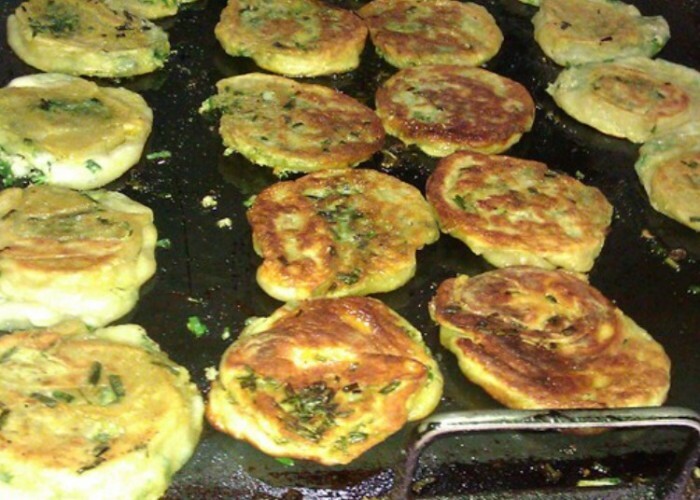 The dough ball is then pressed flat and fried on a greasy flat griddle till its lightly brown on each side. It is then placed in a swallow barrel with hot flames flickering around to achieve a golden brown crispy exterior. One bite says it all. Crispy with aromatic spring onions, it is delightfully flavourful with little bits of minced pork in the dough. Similar to our Roti Prata without the flipping and stretching of the dough, I must say that it is good enough to eat it on its own. Not a stranger to Singaporeans, this is a local favourite dumpling. Wrapped up with pork and shrimps, they are steamed and then pan-fried to crispy golden brown. 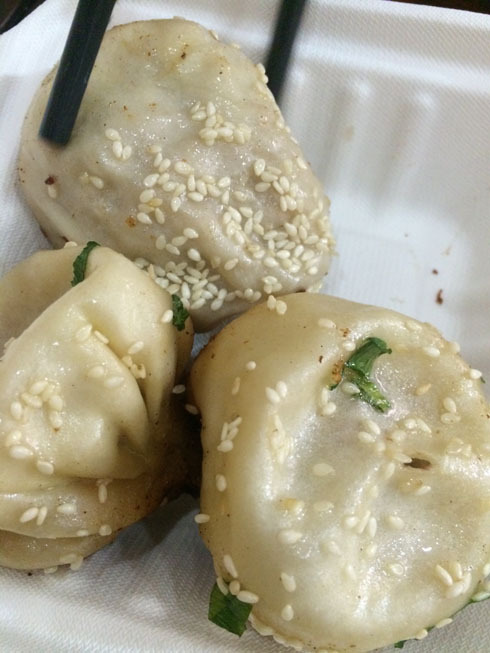 Each sheng jian bao is filled with piping hot juicy pork filling that oozes out. The seafood sweetness of the shrimps provides a balance to the meaty filling. Shanghainese locals will order a serving of Sheng Jian Bao to go with a bowl of duck blood noodle in soup. For the faint hearted or beef lovers, you can choose to have beef vermicelli soup. 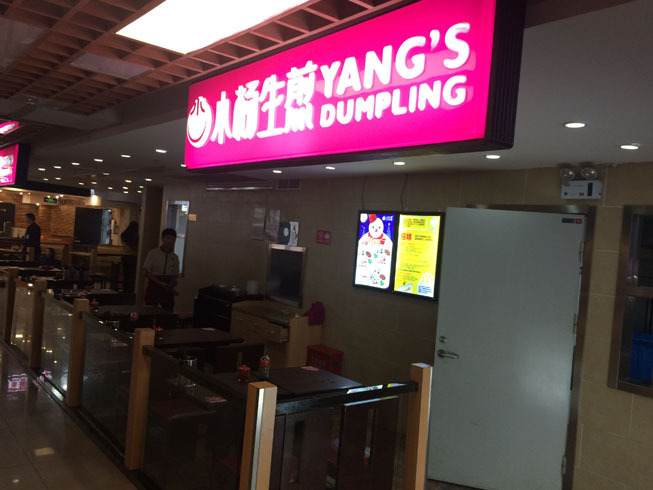 A favourite amongst most locals is a chain store “Yang Dumplings” located in the food court of the shopping malls. Average waiting time is about 10-20mins for a table during peak hour. Like many of the street food mentioned here, they may not be purely Shanghainese but has definitely found their way into the city’s palate. Similar to pigs’ blood, the cubes of solidify duck blood have a soft, firm and springy consistency without the iron-y after taste in the tongue. 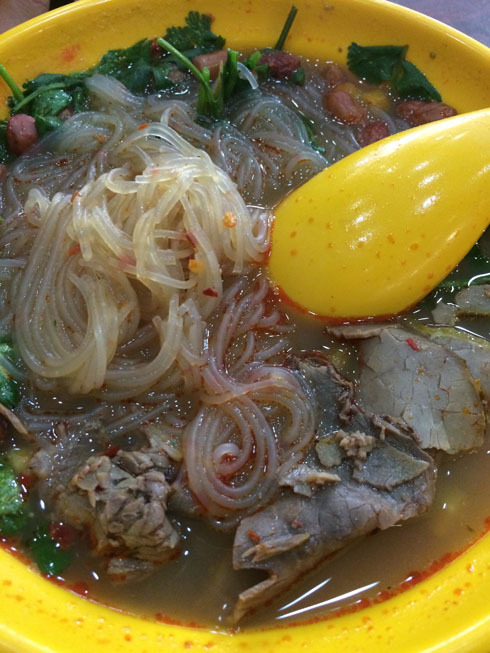 The vermicelli is cooked with a meat stock broth (usually duck bones) with spices. It is not spicy but most places have little containers of chilli oil and vinegar so you can add as much or as little as you like. Highlight of this dish is clearly the duck blood. The smooth silky vermicelli adds a chewy texture which works well in the soup that is sprinkled with generous portion of coriander leaves, spring onions, tao pok cubes and herbs. 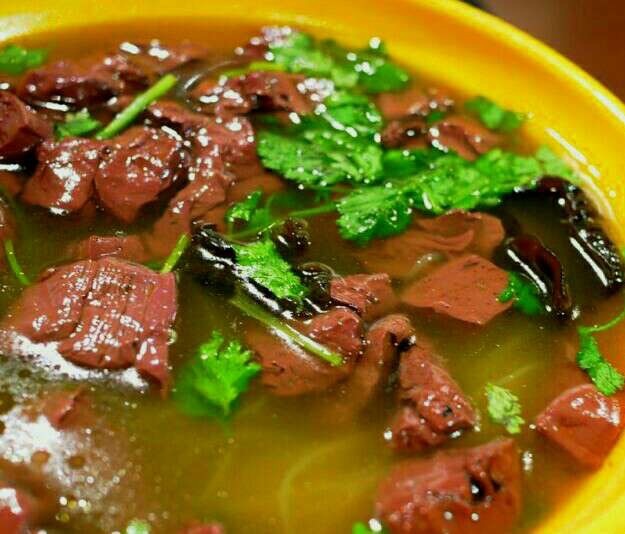 Otherwise you can also opt for the Beef vermicelli soup if duck blood is somethign too exotic for you. 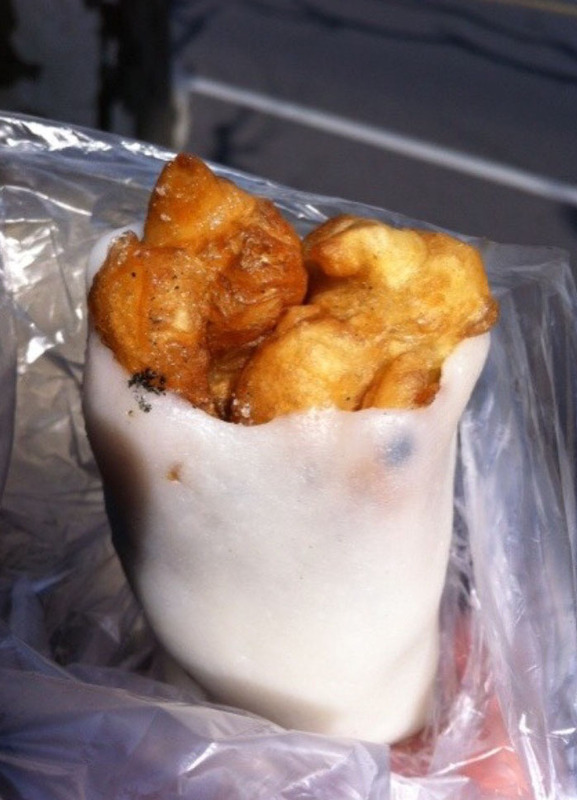 Made on the spot, the muah-chee like glutinous rice dough is wrapped around some you-tiao (dough fritter), and sprinkled with ground black sesame. You may request for some finely chopped pickled mustard (in Singapore, its known as salted vegetables). All the ingredients are wrapped around the glutinous rice dough. Presentation wise, it does not look very appealing. 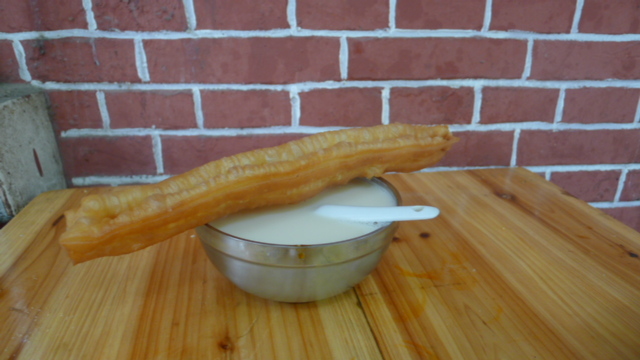 I love the sticky chewy texture with the crunchy you-tiao. The pickled mustard is a little salty and tangy which gives it a balance to an otherwise carbo laden snack. Its very filling though. Small eater with an insatiable appetite. Loves trying new eats but hates wasting calories on lousy food.